26 practice problems and an answer key. This packet helps students determine how many solutions any quadratic equation has. Quadratic equations graph as parabolas (which look more or less like Us or upside down Us). The solutions of a quadratic equation are the points at which the parabola intersects the x-axis. If a upward opening parabola has a vertex below the x-axis, there will be two solutions (likewise, a downward facing parabola with a vertex above the x-axis will have two solutions). A parabola with a vertex on the x-axis has one solution. An upward opening parabola with a vertex above the x-axis has no solutions (likewise, a downward opening parabola with a vertex below the x-axis has no solutions). Once a student starts graphing a lot of parabolas, all of these rules are easy to visualize. However, students typically don't want to graph a parabola to determine if it has solutions or not. 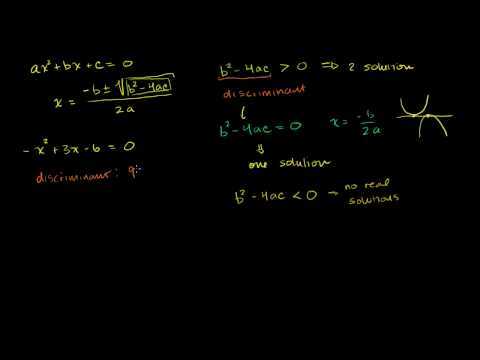 Using the discriminat is an easy to way to determine how many solutions a quadratic equation has (without having to graph or solve the equation). Each page starts with easier problems that get more difficult as students work through the packet. After doing all 26 problems, students should be more comfortable doing these problems and have a clear understanding of how to solve them. Identify a, b and c in the following equations. Then find the discriminant. Find the value of the discriminant then use the value to determine whether the following quadratic equations have two solutions, one solution or no real solution. Students must also be able to rearrange equations into standard form.